Great record shop got all my Roxy's singles there on island label , seeing that bag brings back some great times spent at Rotters /Glad Rags in Offerton Stockport. 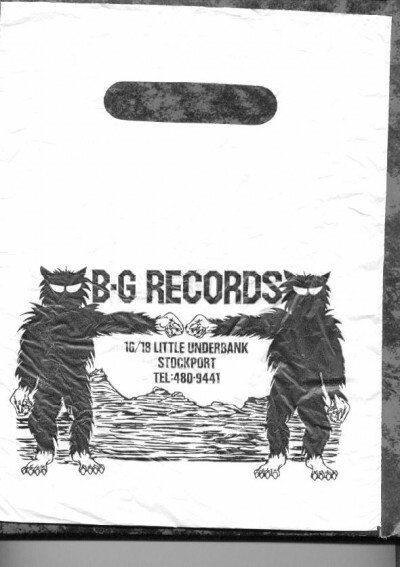 B&G was our hang out in the late 70s got all my punk 7"s there and the band I was in at the time BlackOut had a practice room under the shop. Alien Tint also had a practice room under the shop for a short period in approx 78. It measured approx 8ft x 8ft and came complete with smell that I can remember to this day. When we left for our new practice room, we owed the owner of the shop (Brian???) a number of weeks rent. Sorry!!! Remember being in here the day after John Peel had played Laurie Anderson's O Superman for the first time. There's some lad at the counter trying to describe it going "ah, ah, ah, ah, ah, ah, ah, ah, ah, ah, ah, ah, ah, ah, ah, ah, ah, ah, ah, ah, ah, ah" for what seemed to be hours.